The following lines are going to introduce you to a world you might had no idea existed. 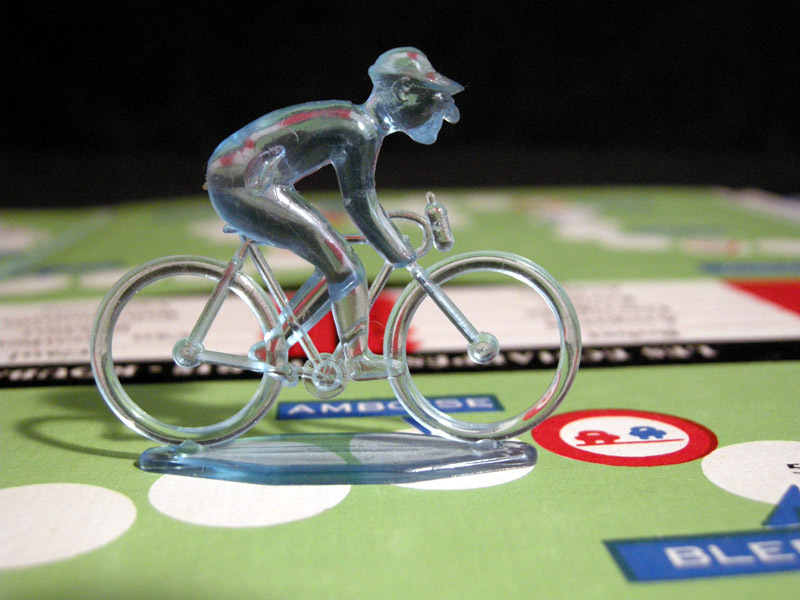 Prepare to be flooded by feelings of nostalgia and persistent thoughts about lazy afternoons, snacks and soda, and thrill of the game. 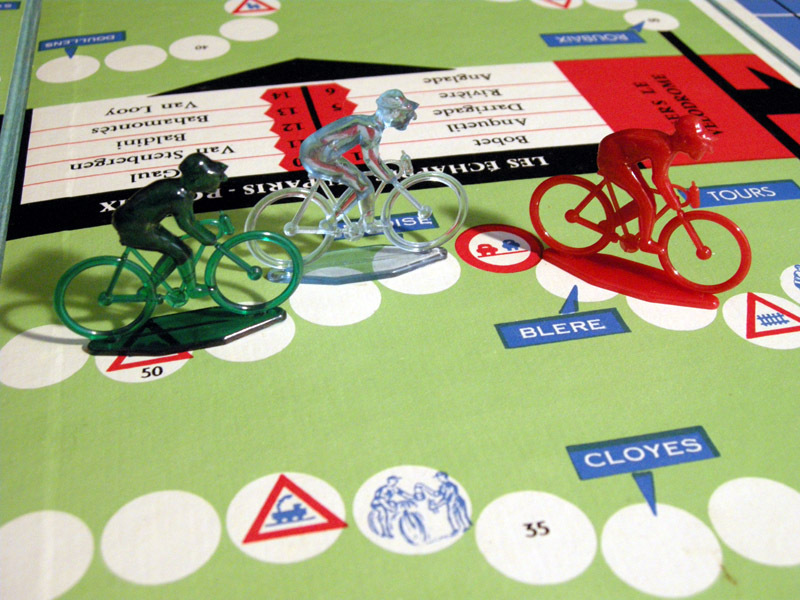 Welcome to Cycling Board Games. 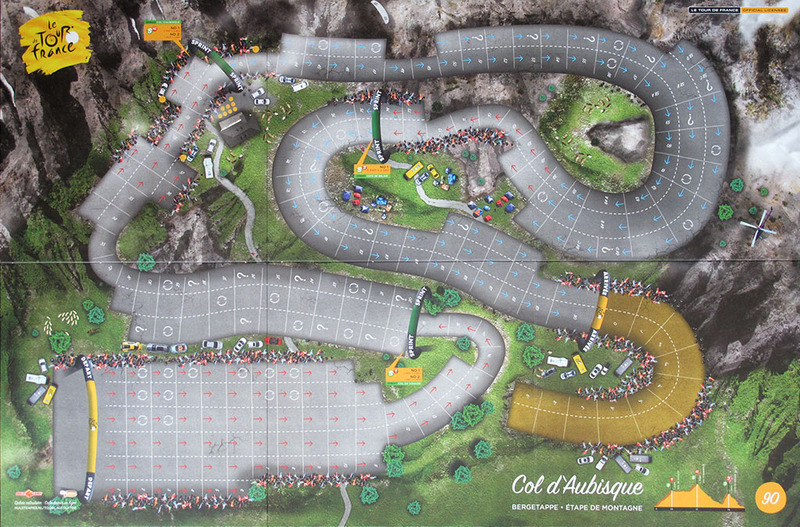 The website might look like it surfed up here on a massive 90s’ wave but don’t get fooled by the layout – it’s a proper treasure trove. The master mind behind the idea is a guy called Anki Toner who currently lives in Barcelona and describes himself as a “musician, collector, lecturer, and analyst of the relation between music and intellectual property”. 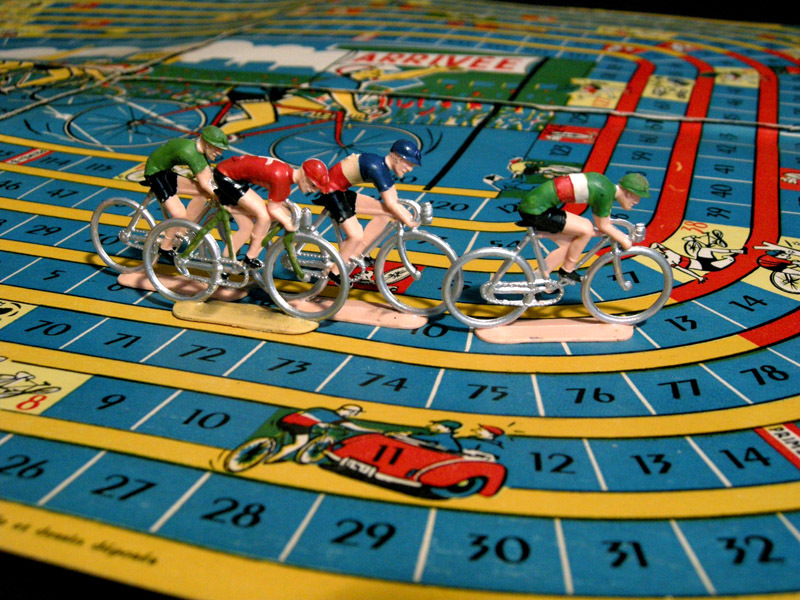 One of those days he simply decided to get his hands on every bicycle race board game there is and make a digital collection. Toner then continues to explain a few more things in a similarly snarky tone, such as how many games the page features (about 300), what’s his favourite one (he made not one, but two lists of those), how does he chose the admissions or if he owns all the games (no). 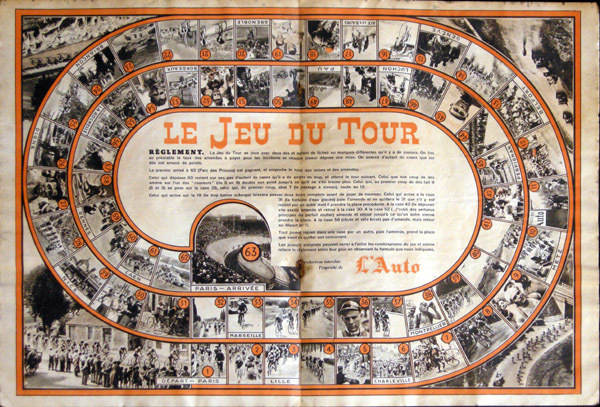 All games are wonderfully documented, with all accessories and direction sheets scanned where possible, and with credits to the original owners. You should definitely go visit his page and go wild but we’ve chosen six examples for the busiest among us, which you’ll find below. 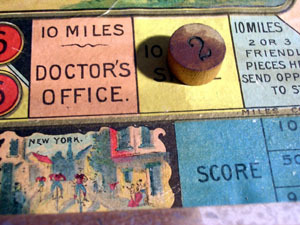 A simple, game-of-goose type game with exceptional number of playing fields and beautiful illustrations, where you move forward by a simple throw of a dice, as it is with a majority of games in the collection. 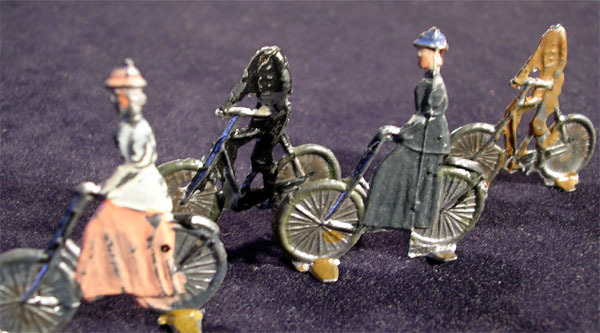 Features a crew of hand-painted tiny plastic cyclists. 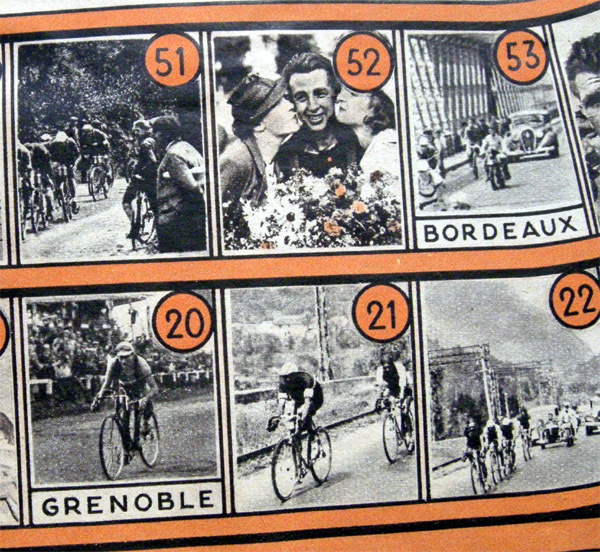 Again, “goose” game as a bonus inside the original L’Auto magazine’s 1937 Tour de France programme. 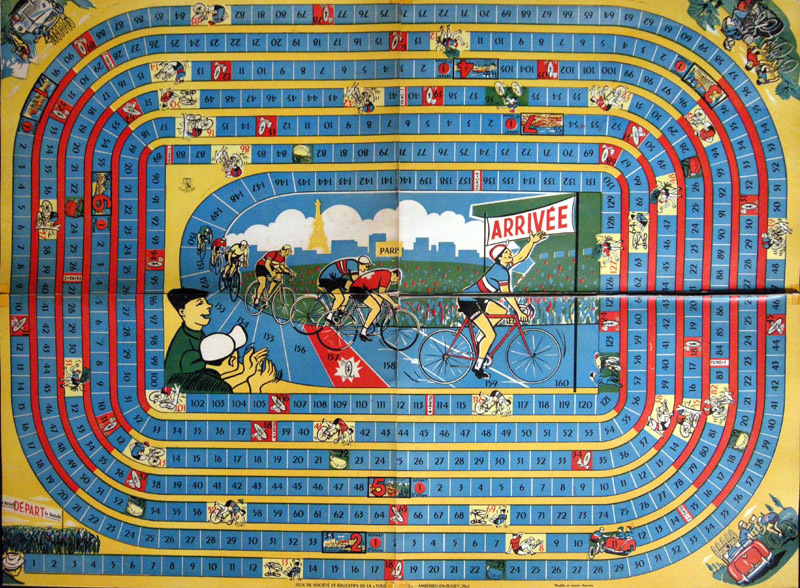 Upon closer inspection, maybe more than half of the games on the page are Le Tour related. 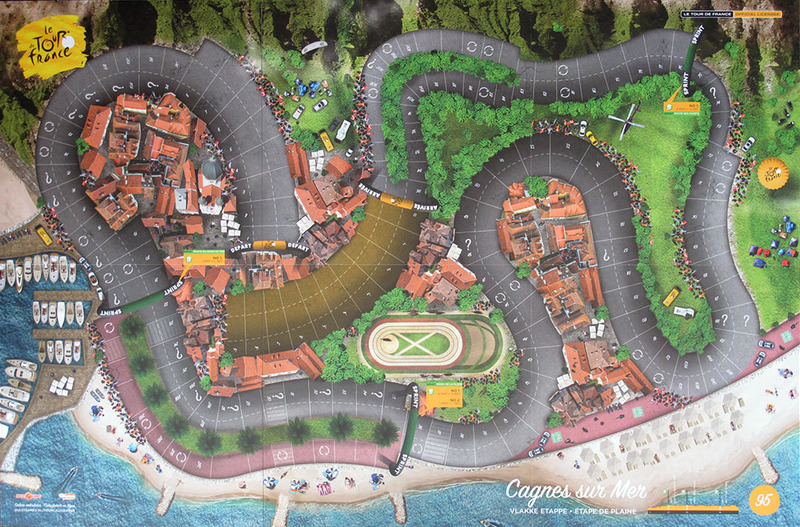 The obstacles on each field are replaced by pictures of famous riders and feature such drawbacks as “disregard of riders’ virtue principles”, which means you have to pass one round because you couldn’t resist the urge to be kisses by two beautiful by-standing ladies. 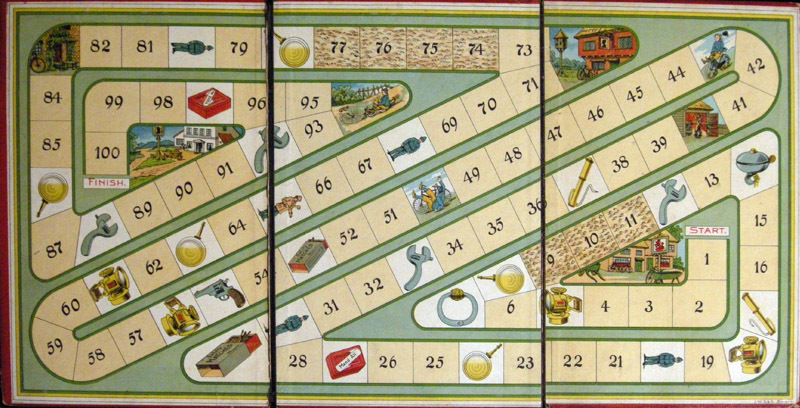 This blandly named game is actually among the most prized in Toner’s collection. 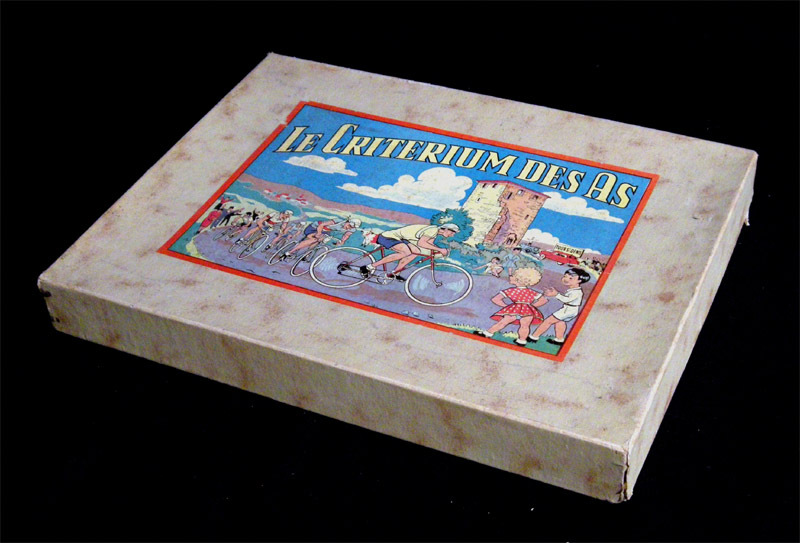 Allegedly, it’s one of the first cycling board games ever made and its mechanics are really thought through. 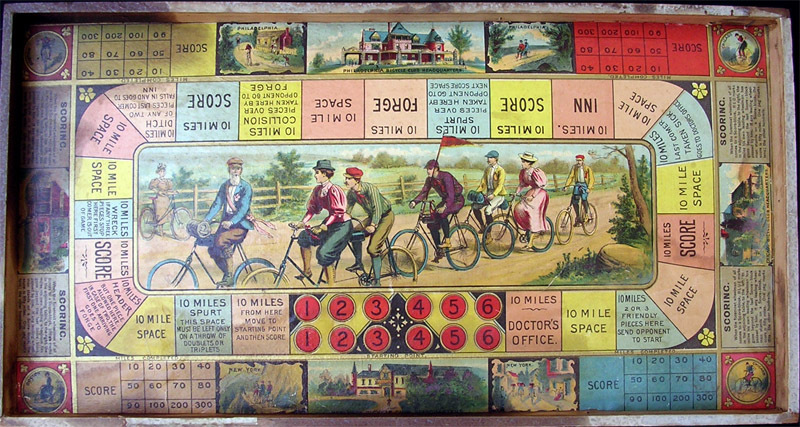 It uses a small spinner, pegs, checkers, and two miniature fellows on bikes to keep the score. This one is truly something else. 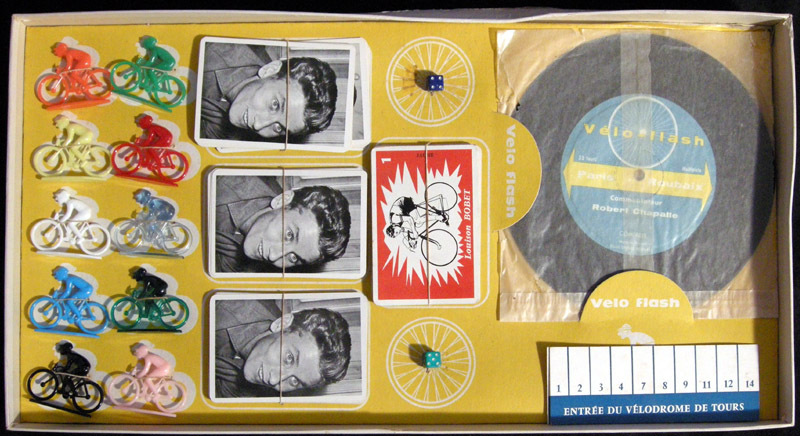 Apart from the playing board and components (such as playing cards and colourful plastic bike riders), it contains a recording on a unique invention – an aleatory disc. Also called the “multitrack” or “magic” record, in layman terms, the sound tracks are overlaying one another so the needle then selects one at random upon lowering. 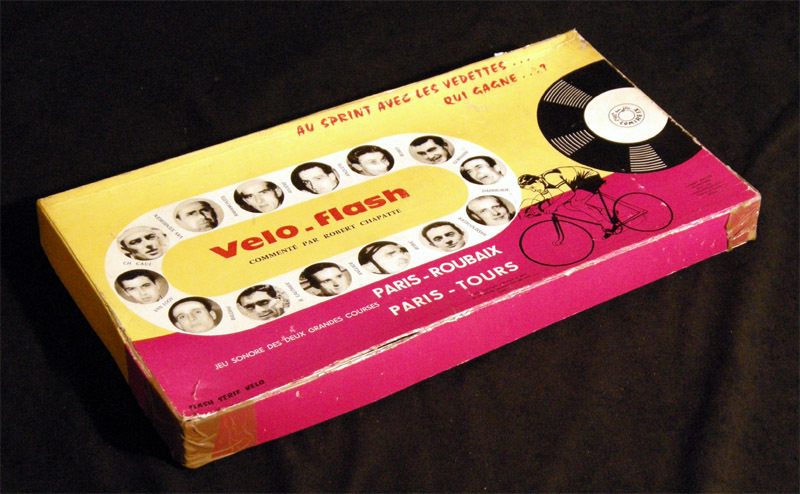 This was used for the sprint part of the “race” where the winner depended purely on chance because the disc contains winning commentary lines for all ten “riders” and the record player’s needle gets to choose the winner. 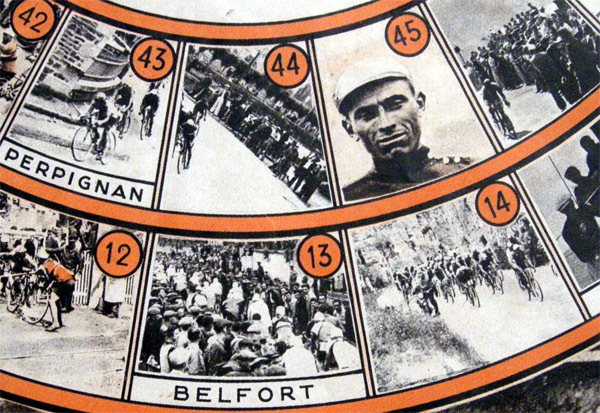 The commentator recorded is Robert Chapatte who was a former Tour de France rider, one of the most respected French cycling journalists, and the inventor of Chapatte’s Law. 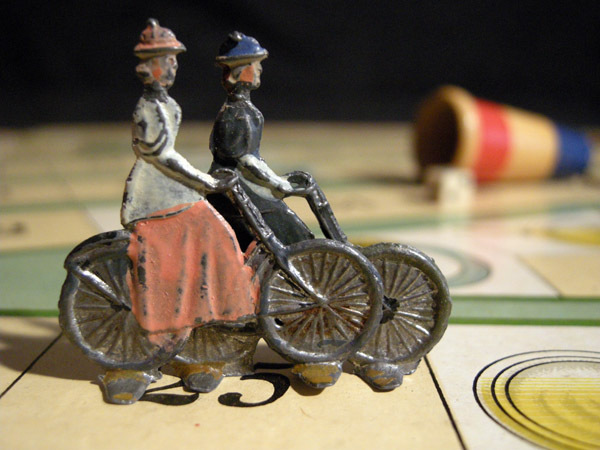 With another underwhelming name comes a classic toss-a-dice board game that we’ve included in the selection purely because those four cute, hand-painted lead Victorian figures on bikes. 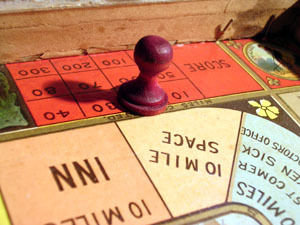 For the last one we wanted to show that Toner doesn’t specialize only in vintage games. 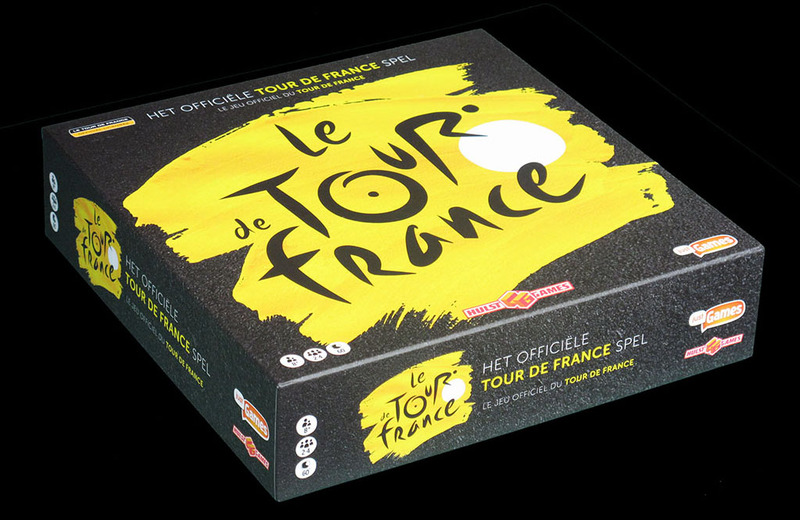 This beautifully done board rendition of this year’s Tour de France was originally a Kickstarter project but was done so well it ended up being a sanctioned Le Tour release. Exploring the next ones is up to you but we must warn you to keep an eye on time because suddenly one, two, or three hours will pass before you know it. 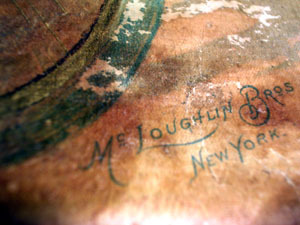 And if you feel like it, you can give Toner a shout out for meticulously preserving such wonderful heritage.